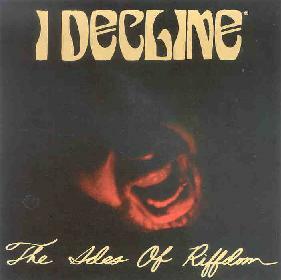 I Decline - "The Ides Of Riffdom"
Remember Helmet? Remember Kyuss? Remember bands that know how to find a good melody and combine it with some pounding ferocious riffs? Listen to I Decline, a heavy grooving band from Chicago. I really like the way the first several songs all run together as one song. The CD even includes a pretty cool bass solo track and a 1 minute drum solo! I remember the days when a hell of a lot of the 70’s hard rock albums had short drum solos. No one does that now days! The CD opens with a serious crescendo, as if it was the last song of the concert and then they blast into "Street Scene", which features some cool Thin Lizzy like harmony guitars, melodic vocals and also some serious pounding riffs. This song goes straight into the "Raze Lazarus" track, a solid melodic rocker. "Yeah You Did" is a really stoner groove rocker of a serious sort. After a one minute drum solo the band go into "Skeleton Dance", a slow heavy as mud track. Stoner rock fans will really enjoy this one. The more I hear it the more I dig it! It is quite funny how in the inlay case the band has two quotes from previous press reviews and both are quite negative and don’t really care for the band. The band must have a sense of humor! For more information you can visit the I Decline web site at: http://www.idecline.tv. Snail mail c/o John Doyle; 9557 S. Bell Ave; Chicago, IL 60643.